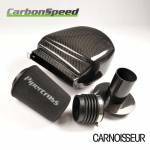 Carbonspeed produce high quality carbon fibre air intake kits for fast road and motorsport markets. Specialising in products for the VW / Audi Group, they offer some of the best performing and cleanest looking kits on the market. Created from genuine carbon fibre (not just a sheet over fibreglass) the quality of their kits are fantastic and will offer performance improvements over the standard airbox by dissipating heat more quickly than plastic.